“I’ve heard of Malawi… Isn’t that where Madonna adopted one of her babies from?” queried one of my clients before my departure for Africa. I winced, but at least she had heard of it. Up to that point, all responses to my intent of visiting the small African nation consisted of confused looks or furrowed brows. Sandwiched between such safari heavyweights such as Tanzania and Zambia, Malawi gets overlooked by most visitors to Southern Africa. 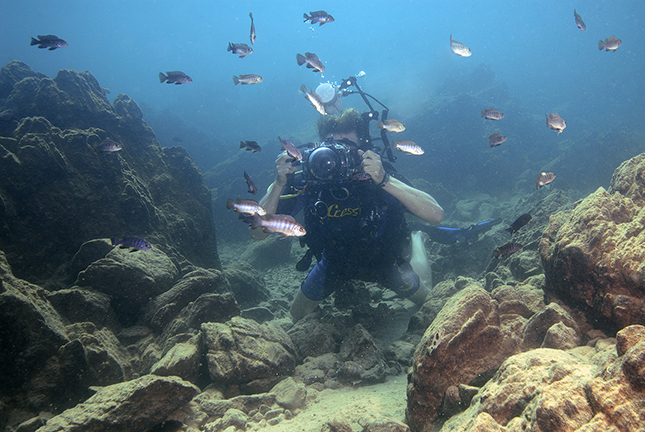 Diver with school of cichlids at Masimbwe Island. Photo by Scott Bennett. For some reason, many people attach an unwarranted stigma to Africa. Whenever there is trouble somewhere, be it political strife or Ebola, many assume the entire continent is hazardous by geographic association. However, as African nations go, Malawi remains refreshingly innocuous. Celebrity adoptions aside, it does not make the news for the wrong reasons. Make no mistake, the country’s small size belies its multitude of attractions. Known as the warm heart of Africa for its friendly people, I quickly realized it could also be called the land of surprises. My departure point was Johannesburg, where I caught a two-hour flight to Blantyre, the country’s main city and business center. Despite being home to a million inhabitants, the tiny airport belied the city’s importance, although a sizable new section was under construction. There was no visa fee, but it was the first time I had ever been fingerprinted at the airport. The queue was sluggish, but I finally got through and collected my bags, which had already come off the conveyor belt. Waiting outside was Christopher from Wilderness Safaris, who then drove me the three hours to Mvuu Lodge in the Liwonde National Park. After all, one cannot visit Africa without doing a safari! With such wildlife icons as Zambia and Tanzania sharing its borders, Malawi is often overlooked as a wildlife destination. With a population of 15 million, Malawi is one of the poorest countries in Africa. En route, the three most well-constructed structures were churches, mosques and petrol stations. Fortunately, Malawi seems to be avoiding religious strife, a sad reality in many countries worldwide. “No problems here,” said Christopher with a smile. Several hours later, we arrived at Liwonde. Upon paying the park fees, we set out for Mvuu, the sole lodge located within the park boundaries. This was my third trip to Africa, and my first during the dry season. Dry and dusty, the landscape was dominated by a profusion of baobab and candelabra trees, the latter named for their array of cacti-like branches sprouting near the top, giving it the appearance of a candelabra. En route, game was abundant with impala, bushbuck, waterbuck and kudu. A herd of elephants was an unexpected surprise, with quite a few juveniles present. Mvuu Wilderness Lodge. Arriving at Mvuu, I met resort manager Sarah Glyde, who gave me a quick tour prior to check-in. A month earlier, the jetty had to be relocated after a colony of white-throated cormorants took up residence in a tree alongside the walkway. It was moved away far enough to prevent guests from getting “frosted”. Discreetly nestled on a small lagoon off the Shire (pronounced “Shir-ee") River, the camp was simply stunning. Resting on a raised platform high beneath an imposing thatched roof, the main lodge featured an open-air reception and dining area, offering superb views of both the lagoon and the Shire River beyond. Lodge facilities included a dining room, pub, lounge area, library and swimming pool. Accommodation was comprised of eight luxurious “tents” for a maximum of 16 guests, each with ensuite bathroom facilities and a private viewing platform overlooking the water. Shire River. It did not take long to spot some wildlife. Egrets waded through the lagoon’s shallows while some imposing crocodiles basked on the muddy riverbank. Mvuu means “hippo” in the local Tonga language, and the name could not be more fitting. Approximately 2,000 hippos reside in the Shire River, and seeing them is a 100 percent certainty. To me, their snorting and bellowing is a sound synonymous with the African bush. Being at the very end of the property, it was a bit of a trek to my tent. 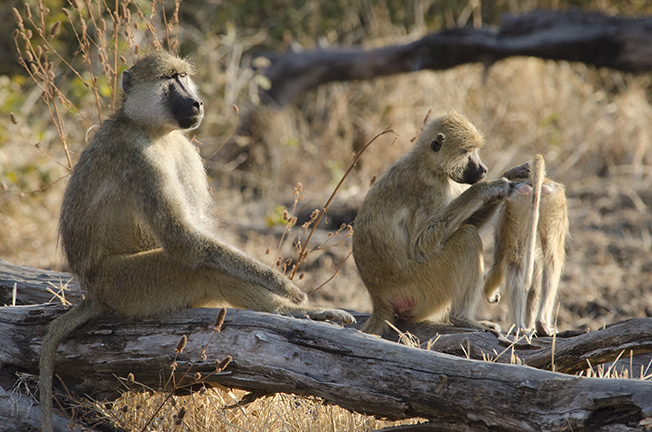 Passing a cluster of candelabra trees, I startled a troop of yellow baboons, which promptly scattered. Boasting quintessential safari décor, my “tent” was a revelation. The roomy interior featured traditional thatched construction, accented with African art and a huge canopied bed. The mosquito netting was not simply tucked into the mattress but cascaded to the floor away from it, allowing easy maneuverability. In many years of travel, I had never seen this before. Genius! A verandah overlooking the river completed the picture. I even had a welcoming committee in the form of a bushbuck. Sitting absolutely motionless, she allowed the opportunity for frame-filling portraits. There was no time to waste, as I had arrived in time for sundowners—that most essential of safari pastimes. A short drive brought me to a lookout over the Shire River, where I enjoyed a glass of wine, as the setting sun burnished the still waters to liquid gold. Night drive. Afterwards, a night drive yielded kudu, white-tailed mongoose, genets, scrub hares and even a bushbaby hopping along the ground. Back at the lodge for dinner, Sarah asked what I would like to do the next day. Activities included guided bush walks, game and boat drives. I opted for the latter, which provided tremendous photo opportunities, especially for birds. Over 300 of the country’s 650 species reside within the park. Boat drive. The next morning, coffee and biscuits arrived just before sunrise. Sipping a steaming java with the bush’s chorus as backdrop was a sublime start to the day. At the jetty, I met Mathews, who would be my guide for the morning. Midway across the river, the clouds rolled in, dashing my planned sunrise photos. My disappointment proved short-lived as the photo opportunities came fast and furious. The birdlife was spectacular, with open-billed and yellow-billed storks, African spoonbills, fish eagles, African pied kingfishers, little bee-eaters, reed cormorants and African jacanas, to name but a few. Wire-tailed swifts were constant companions, perching on the boat’s bow or under the canopy barely an arm’s length away. Hippos were also abundant. Fortunately, Mathews knew exactly which to approach or which to avoid. Elephants grazed the marshy areas, as cattle egrets snapped up insects disturbed by their enormous companions. Crocodiles basked at the water’s edge, propelling themselves into the water if we approached too closely. Having been afloat for a few hours, Mathews suggested that we go ashore to stretch our legs. Clambering up the embankment, I stopped dead in my tracks. In the clearing sat a linen-clad table with a portable grill, attended by a beaming chef. “Would you like an omelette, sir?” Nearby, a fully-set table groaned beneath copious amounts of sausage, bacon, eggs, toast, muffins and fresh coffee. Sitting down to eat with hippos bellowing in the river was beyond words. Well, maybe three: Best breakfast ever! The Sanctuary. Within Liwonde is a 4,000 ha fenced area called “The Sanctuary", where a number of rare species—like buffalo, Lichtenstein’s hartebeest, zebra, roan, eland and black rhino—have been introduced. The Liwonde Black Rhino Project, initiated in part by Wilderness Safaris, has established a small breeding population to provide a source of animals to establish in other parks. Black rhino became extinct in the country in the late 1980s. Although we did not see any, middens (rhino latrines) indicated their presence. We were lucky to see sable antelope (a first for me), several hundred of which reside in the sanctuary’s mopane woodland. Another first was a bush pig, a slightly more attractive relative of the warthog. Generally nocturnal, they emerge prior to dusk during the dry season when temperatures are cooler. The nominal entry fee of several dollars was well worth it. The following morning, a second boat cruise filled my flash card to the bursting point. Back at the lodge for breakfast, a pair of warthogs sauntered through the outdoor dining area. One accidentally toppled a chair, startling itself so much that it jumped a meter backwards! Although brief, my stay at Mvuu was spectacular. 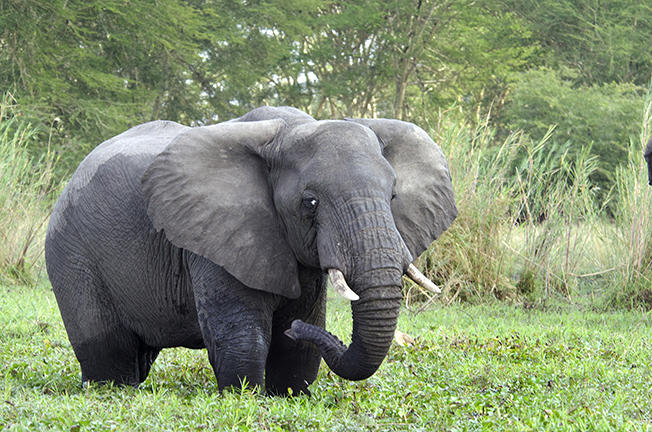 Although Malawi is not regarded as a safari destination, Liwonde’s wildlife was most impressive. I could have easily spent a week at Mvuu! A drive of several hours brought me to Cape Maclear in the Lake Malawi National Park. A notable landscape feature was the abundance of baobab trees. With bare branches and immense swollen trunks, they bore the appearance of a tree planted upside down. A World Heritage Site, the world’s first freshwater national park encompasses the Cape Maclear peninsula as well as the lake itself and islands up to 100m offshore. Upwards of 23 dive sites are located within the park’s boundaries. Cape Maclear. Cape Maclear is a resort area with a really interesting vibe. Abounding with overseas backpackers and souvenir vendors, I felt like I was in Southeast Asia rather than Central Africa. My first night would be spent in Cape Maclear at Mgoza Lodge. First, I stopped in at Kayak Africa, the dive operator during my stay. Meeting up with manager Joseph, I was given a rundown on the ensuing days’ itinerary. I would do a pair of dives en route to Domwe Island, where I would spend the first night. Patrick would then pick me up the following morning and take me to Mumbo Island, where I would do more dives before checking into the resort. Situated right alongside the beach, Mgoza Lodge proved basic but comfortable. With no power at the ensuing night’s accommodation, I embarked on a battery-charging marathon. Stepping out for a pre-dinner stroll, I was immediately approached by a smiling young man. “Hello! Where are you from? What is your name?” I immediately recognized the sales pitch. The souvenir of choice was a key chain attached to a personalized wooden nameplate. “I just arrived,” I pleaded. “Maybe tomorrow?” “No problem,” he responded and set off in search of a new victim. I then meandered down to the beach where a number of kids were playing. Seeing my camera, they all came running. A minor melee ensued, with each jostling to be in the forefront. Getting a simple portrait of one was a near impossibility. At 500m above sea level, Lake Malawi is no ordinary body of water. Called “Lake of Stars” (coined by missionary David Livingstone due to distant fishermen’s lanterns resembling stars) this inland sea is brimming with superlatives. One of Africa’s Rift Valley lakes, its vast basin was fashioned by titanic geological forces that continue tearing the continent apart. Plummeting to a depth of 800m, the world’s fifth-largest lake features the largest number of fish species of any lake in the world. At the southern end, the Shire River flows outwards towards the Zambezi River in Mozambique. Despite its voluminous extent, the lake is conspicuously lacking in large underwater fauna. What it does have is cichlids. LOTS of cichlids. From a few initial colonizers, upwards of a thousand endemic species have evolved, with many more awaiting discovery. In comparison, Lake Tanganyika, 350km southeast, possesses a fraction of the species count despite being substantially larger. The remarkable endemism is due to a number of factors, with isolation from other major bodies of water having a significant impact. Highly territorial, many reside in one compact area their entire lives, creating inbred communities that diverge into new species. The next morning, I awoke to overcast skies once again. After a short walk down the beach, I tucked into breakfast at the lodge’s beachfront dining area. The coffee was especially good. According to the label on a bag I purchased, it improves mental performance and reduces the risk of gallstones, diabetes and liver cancer. Perhaps I should have bought several kilos. While eating, a remarkable sight unfolded. The bank of cloud ended abruptly in a straight line that stretched across the horizon. Within minutes, the day transformed to brilliant sunshine and a blue sky. Tumbe Island. Venturing back to Kayak Africa, I met Patrick, who would be my divemaster for the next two days. With luggage and dive gear aboard, our destination was Tumbe Island, a 30-minute boat ride away. Gearing up proved especially interesting. In the ocean with my 3mm suit, I normally require 7-8kg of weight, but a steel tank combined with less buoyant fresh water required only 3kg. Definitely a first! With a water temperature of 23°C, I was hoping my 3mm would be warm enough (Patrick had on 5mm). Plunging in, I noticed an initial chill, but that quickly subsided. Not bad for winter in Africa. The Wreck. The morning’s first dive site was The Wreck. A 15m steel-hulled vessel sunk specifically for diving, it rests upright at a depth of 30m. Heading down the slopes to the wreck, visibility was limited to less than 10m, so I ensured that Patrick always remained in close proximity. Cichlids were everywhere in a staggering array of shapes and colors. It was hard to believe they had descended from a solitary species. The terrain’s predominant feature was an abundance of granite boulders, some the size of houses. A large blue crab peered out from under a rock, scuttling to the safety of a deep recess as I approached. Despite the lake’s immense size, the crabs are the premier scavengers. 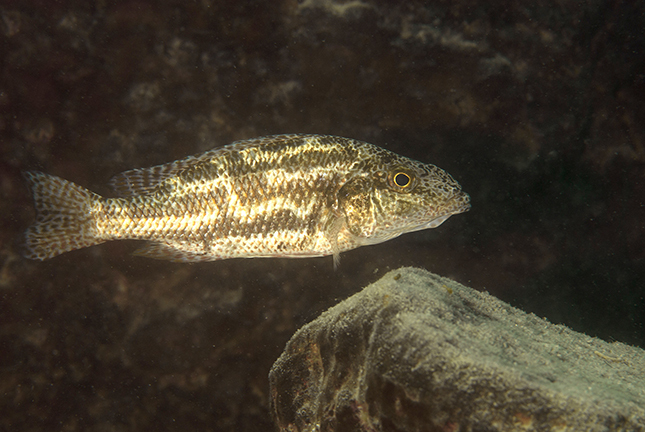 Vegetation was surprisingly absent, but every surface was cloaked with algae, the primary food for many cichlid species. A few, however, eat other cichlids. Arriving at the wreck, Patrick ventured into the wheelhouse to pose for a photo. Penetration is possible and is safe due to the superstructure’s simple layout. 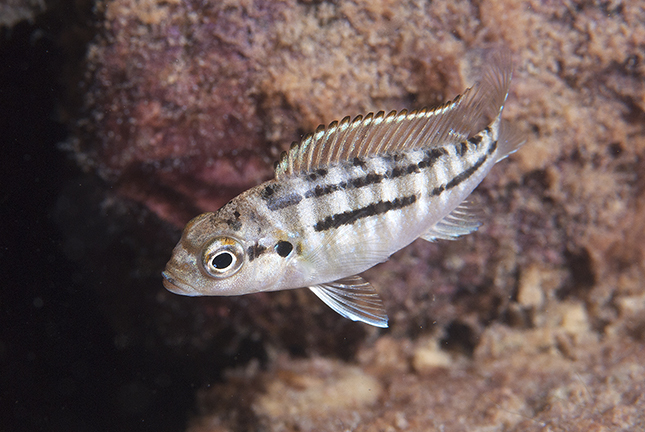 Although lacking the growth of an oceanic wreck, it proved to be a magnet for cichlids. Descending to the stern, we encountered a pair of kampango catfish. Dwarfing the cichlids, they were the biggest fish in the lake, with some attaining lengths of 2m. Unfazed by our presence, they allowed a close approach for wide-angle photography. When our bottom time maxed out, we ascended the gradual slope, marveling at the huge boulders and abundant cichlids. After the challenging conditions I had encountered in South Africa, diving Lake Malawi seemed like a swimming pool! The Aquarium. Completing our surface interval, we motored around to the other side of the island to our next site called The Aquarium. I quickly realized the name could not be more apt, being instantly enveloped by cichlids of even greater numbers and varieties. This time, I took down both macro and wide-angle camera setups, and both were kept busy! Some curious crater-shaped formations on the sandy bottom drew our attention. 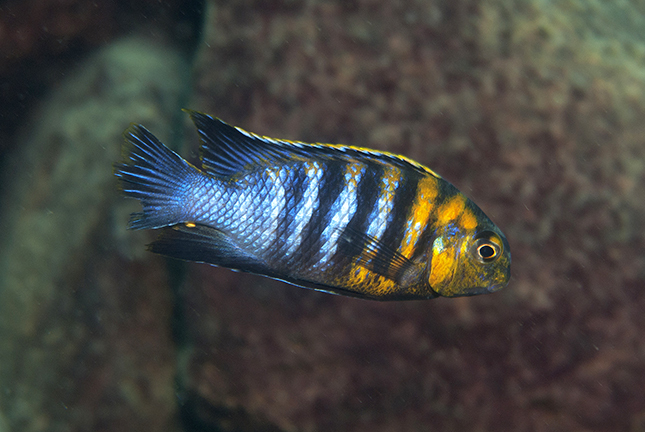 Remarkably, they were nests made by male cichlids to court females. 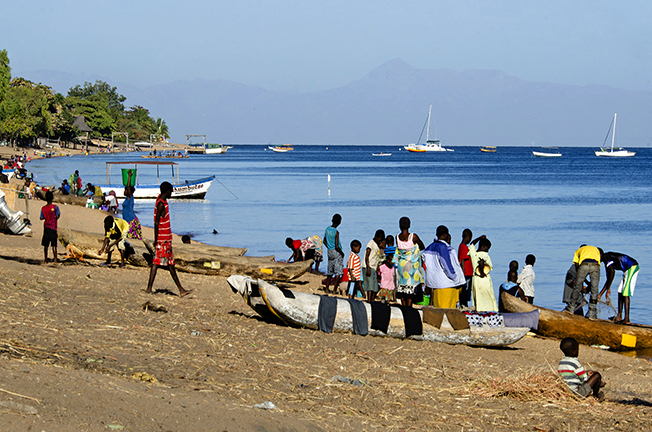 With a circumference of 11km and its highest point 400m above lake level, Domwe is Lake Malawi’s largest island. “Welcome to paradise,” exclaimed a departing guest as I waded ashore. He wasn’t wrong; granite boulders flanked the beach like gigantic scattered marbles while dense vegetation cloaked the rugged slopes above. Accommodation is provided by a trio of fully-furnished safari tents and two tent sites, complemented by a dining area with bar and a water sport gazebo. Meandering around the boulders, a sandy path led me to my tent sitting astride a wooden platform. With birdsong as the only accompaniment, I felt like Robinson Crusoe on my own private island! Arriving in time for lunch, I headed over to the dining gazebo where I met a pair of med students from the United Kingdom, who had brought their own food. “You’ve come to the crappy island first,” mused one. Crappy?! If this was crappy, I could hardly wait to see what Mumbo had in store. In reality, he was just joking. Offering more basic accommodation, Donwe is considered the backpacker island, while Mumbo’s resort is more upscale. The next morning at breakfast, I finally met my cook. He apologized profusely for the lack of eggs, as they had not been packed the previous afternoon. The poor fellow had actually worried about it all night! I assured him it was fine and happily loaded chopped sausage and cheese onto my breakfast roll. Patrick arrived right at 9:00 a.m. and we set out for Mumbo Island. While much smaller and flatter than Domwe, it proved no less dramatic. The island’s circumference was a jumble of boulders spilling to the water’s edge, with baobab and candelabra trees crowding each other for space. Tooth Rock. The scenery was equally dramatic underwater. Tooth Rock featured a series of pinnacles descending down to 50m. At 18m, visibility was only 5m at the start. While photography was limited by the conditions, there were plenty of overhangs and swim-throughs to explore. Ascending for our safety stop, the water became crystal clear, with immense boulders dwarfing the never-ending cichlids. Mpipi Bay. 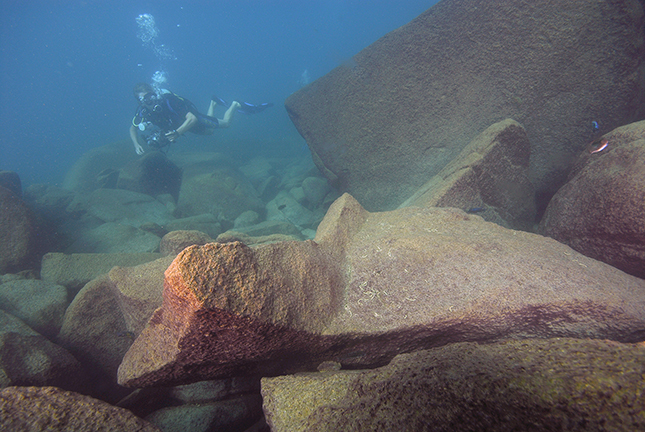 The follow up dive at Mpipi Bay featured rocky slopes descending gradually to 100m. In the shallows were water plants, the first underwater vegetation I had seen aside from algae. Venturing deeper, we encountered a variety of new fish species. 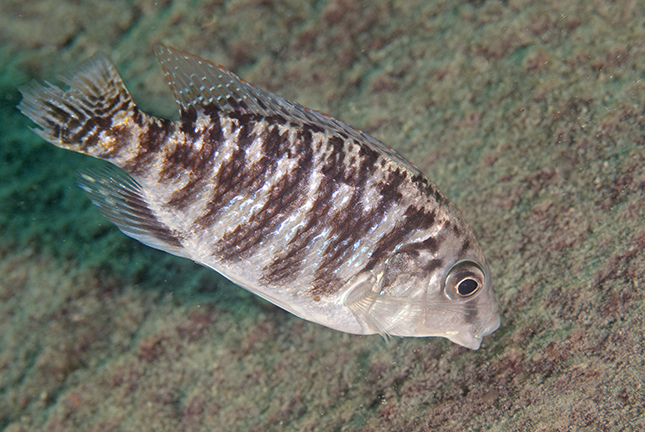 Silvery chambo are a favored food species for the local people as are the non-cichlid usipa, the latter swarming in great numbers near the surface. I even had a brief glimpse of a small eel. Having finished diving by mid-afternoon, we headed back to the resort on Mumbo. Once again, I found myself grasping for superlatives. If anything, my tent’s location was even more spectacular than at Domwe. Looking across a small aquamarine bay, I ensconced myself in the hammock as African fish eagles wheeled overhead. Sheer bliss! Earlier, I was asked if I wanted to go on a sunset cruise. Arriving at the jetty at 5:00 p.m., my cruise vessel was of the no-frills variety: a rowboat, with only a guide, a beer-packed cooler and myself. Heading out, conditions were rough on the resort side of the island, but calmed right down on the sunset side. The trip proved magnificent, with rugged scenery and plenty of birdlife, including several African fish eagles. Bidding Cape Maclear farewell, I embarked on the final leg of my Malawian adventure. After a four-hour road trip to Lilongwe, I caught my Ulendo Airlink flight to Likoma Island. Stopping at a gas station outside of town, we were immediately besieged by souvenir vendors. The wooden toys were especially impressive, with everything from bicycles to VW Beetles. Between the drive and an airport layover of several hours, it was a long travel day. Fortunately, the flight was only an hour and arrived at Likoma by late afternoon. Dutifully waiting in an old Land Rover was resort manager Josh. With everyone aboard, we embarked on the short drive to Kaya Mawa Resort. 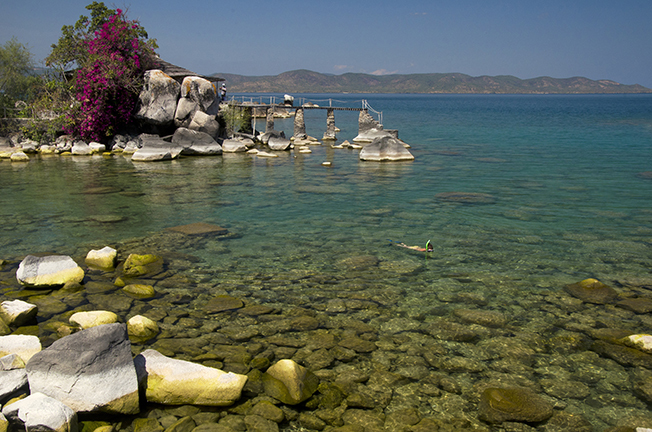 Situated in the northern portion of the lake, just off the Mozambique coast, Likoma is something of an anomaly. Along with neighboring Chizumulu, the island is part of Malawi, courtesy of the British. In 1880, missionaries from the Universities’ Mission to Central Africa established their headquarters on the island. In the early 20th century, a large Anglican cathedral was erected on the island to further bolster their presence. As a result, the island was ceded to Malawi rather than Mozambique when national borders were established after World War II. Kaya Mawa Resort. Yet again, Malawi managed to surprise. I knew the resort was going to be nice but I was not quite prepared for HOW nice. Translated as “Maybe Tomorrow” in the local dialect, Kaya Mawa was dazzling, nestled along a golden sweep of beach framed by palm and baobab trees. Their blossoms flaming purple, Bougainvillea trees added a dazzling splash of color. Calling my accommodation a “room” was an understatement. Located at the end of the beach, my villa’s roomy interior featured stone walls and a massive bed draped with mosquito netting. Outside, a private verandah with lounge chairs completed the picture. While unpacking, I noticed staff moving tables down to the beach. I discovered that dinner was served right at the water’s edge by lamplight. The appetizer of pan-fried halloumi cheese and cashew salad with a ginger glaze was a standout. Dining on gourmet cuisine as a multitude of stars twinkled overhead made for a spectacular end to the day. I learned the resort has been voted one of the ten most romantic honeymoon resorts in the world by Conde Naste magazine. Being there on my own, I could have lived without that particular nugget of information. The following morning, I wandered over to the dive center to meet Kevin, the resort’s water sports manager. Also along for the day’s dives was Aaron Gekoski, a photographer from the United Kingdom and his partner, Gemma. Having another photographer along ensured I would not be the only one slowing down the group. I even managed to get my weight belt down to 2kg and likely could have dropped it to one. On the first day, we did a pair of dives in the morning with a third in the afternoon after lunch. Anchored off Likoma’s northwestern side, Masimbwe Island quickly became a favorite. Masimbwe Island. Featuring shallows on the east with deep drop-offs on the west, the fish life was profuse and the scenery dramatic. Like colossal steps, huge boulders tumbled down to 26m. Heading deeper, crevices concealed hefty catfish that allowed a close approach. Kevin indicated a curious linear pattern etched into the rock believed to be carving. I even observed a freshwater sponge; something I did not even know existed! Visibility at the safety stop was outstanding, and I was able to get numerous cichlid portraits. However, one subject remained maddeningly elusive. 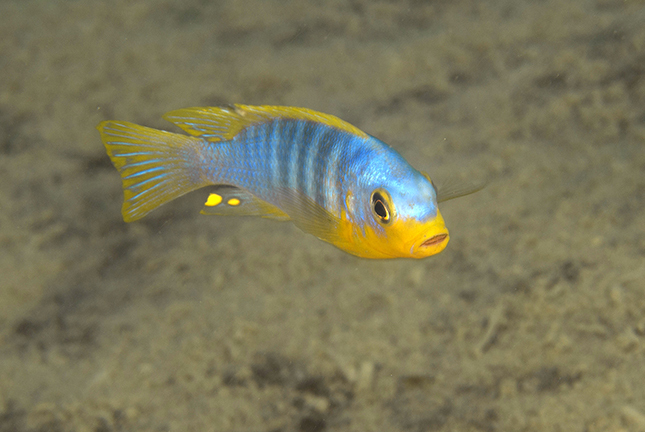 Many Malawi cichlids are mouth brooders, with juvenile fish protected within their mother’s mouth. Keeping a mindful eye on her free-swimming offspring, she will gulp the babies back in at the first sign of danger. I could not help but wonder if any had ever been accidentally swallowed. Having missed them at Cape Maclear, I really wanted to see this phenomenon in action (the mouth brooding, not the swallowing!). Christian’s Point. A second dive at Christian’s Point proved more fruitful on the mouth brooder front. The key was to search for a school of juveniles, an indication that the mother must be close by. Before long, we witnessed the mouth brooding behavior in action. Getting a photo proved challenging as the action was lightning fast. We even found some juveniles forming a miniature bait ball, a behavior Kevin had not encountered before. Back at the dive shop, species classification proved daunting as many not only looked similar but also had no common names. It did not help that the identification book had the girth of a dictionary. Switching to wide angle for a return visit to Masimbwe Island, visibility was at least 15m, the best I had seen on the trip. I managed to get another kampango image, while Aaron made a good model, posing with swarms of obliging cichlids. Back to macro for my final dive, I finally managed to photograph juvenile cichlids inside their mother’s mouth. 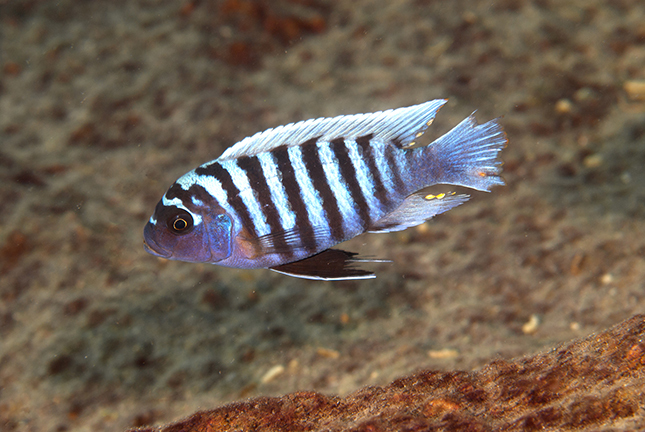 Regrettably, some cichlid mothers will not be winning any parenting awards. 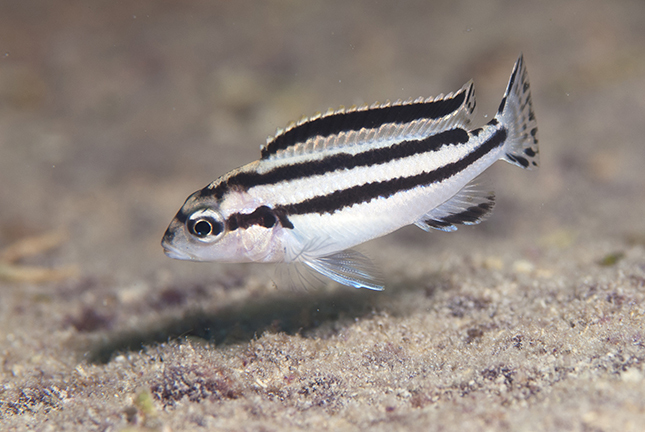 We witnessed cichlid genocide on several occasions as hungry predatory cichlids decimated juveniles with the mother nowhere in sight. Talk about feeling helpless. Despite nearly a month in Africa, the safari bug was still biting. I opted to visit Zambia, one of the continent’s premier safari destinations. With just a few days to spare, I settled on South Luangwa, arguably the country’s most famous national park. From Lilongwe, I connected with an hour-long Ulendo Airlink flight to Mfuwe Airport, gateway to the park. Arriving at the emptiest immigration queue of all time (just me), I had to wait a few minutes for the officer to finish lunch. After paying my US$50 entry fee, I had officially arrived in Zambia. Waiting outside was my transfer from Norman Carr Safaris, one of the country’s most celebrated operators. I would be staying at two of the company’s camps within the park: Luwi and Chinzombo. The latter had just opened a month earlier and was already regarded as one of the country’s most luxurious safari camps. Established as a game reserve in 1938, South Luangwa became a national park in 1972 and now encompasses 9,050 sq km. 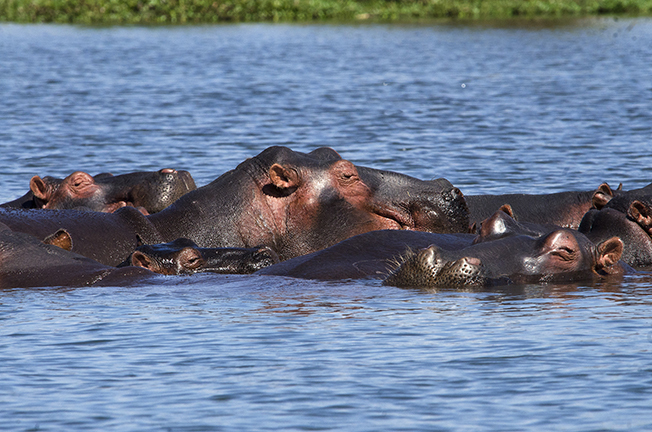 Regarded as Africa’s most intact river system, it is home to intense congregations of wildlife. Mopane woodlands comprises the valley floor, with grassy patches interspersed throughout, attracting a profusion of browsers and grazers. From the airport, it was a 90-minute drive to the park. Passing numerous villages where children waved to us, smartly attired in their school uniforms. Entering the park, civilization abruptly vanished and nature took control. It would be an additional hour's drive to Luwi, doing a game drive en route. Despite the mid-day heat, there were plenty of animals about, including Thornicroft’s giraffe, a regionally endemic sub-species. Luwi Camp. Shaded by mahogany trees, Luwi Camp is situated deep within the national park, alongside the seasonal Luwi River. Extremely remote, with no other camps in the vicinity, Luwi is one of Luangwa’s most traditional camps, rebuilt each season using natural materials. Simple yet comfortable, rooms featured en-suite bathrooms with hot showers. On hand for my arrival was camp manager and guide, Brian Mukumbuta, who gave me a rundown on the activities. South Luangwa is famous as the birthplace of African walking safaris. After a chance to unpack and have afternoon tea, it was time for an afternoon game drive. Our destination was a hippo pool a short distance from camp. With water diminishing throughout the park, it was hippo central, with two dozen animals jostling one another for space. I finally got my chance to photograph them yawning, the massive tusks contradicting their comical appearance. Egrets perched on their ample backsides while crocodiles sunned themselves at the water’s edge. After dinner under the stars, I was ready to call it a night at the late hour of 9:00 p.m. I had barely closed my eyes, when distant roaring jolted me awake. Lions! That, combined with a sudden onslaught of allergies, ensured a near-sleepless night. Then again, who goes on safari to sleep? Walking safari. Up at sunrise, it was surprisingly cool and a bowl of hot porridge really hit the spot. I especially liked the coffee mugs suspended by the branches of a dead tree. First up was a three-hour walking safari. Walking safaris originated in South Luangwa and are still one of the finest ways to experience the unspoiled wilderness. Along with Brian and an armed guard, Tim, Lucy and I set out, first traversing the Luwi’s sandy expanse. Free-flowing during the wet season, it was now a vast highway of sand. For me, walking safaris are equally exhilarating and nerve-wracking. The idea of an unexpected elephant encounter and having to climb a tree is unnerving, as my tree-climbing days are long past (not that I even had any when I was young). The rainy season’s luxuriant green had withered, replaced by tones of ochre and amber. The tall grass had vanished, now short and dry from the burgeoning heat. In the open woodlands, it was easy to see what was coming. A distant roar caught Brian’s attention and we set out to find the owner. I marveled as Brian deciphered the trail’s patchwork of tracks, pointing out warthog, puku and honey badger, to name a few. “See here?” he gestured. “This is the lion we heard. Now he is running to keep ahead of us.” We never did find him. In the distance, a remnant pool clung to life at a bend in the river. Hiking to an overlook, a multitude of hippos packed tightly into the remaining black water. Gas bubbled and churned to the surface as hippo poo bobbed profusely. Even from high above, the aroma was gag inducing—this was not nature at its most sublime! Game drive. After lunch and a mid-day break, we set out for an afternoon game drive. Lots more wildlife appeared, including zebra, puku, warthog, yellow baboons and some distant elephants. One muddy pool held a lone male hippo, his rear flank bloody from a recent skirmish. The look of wild-eyed fear in his eyes was haunting. Banished from the herd, his days were numbered and he knew it. A night drive after sundowners resulted in a truly spectacular encounter. Driving off road, torch beams illuminated hyenas feasting on a huge buffalo carcass. With eyes glowing yellow, the hyenas cackled in the dark—a sound that was positively unsettling. I expressed surprise that it did not smell, but spoke too soon. On cue, an utterly noxious aroma assaulted my nostrils that was stomach churning. “It’s probably gas escaping the stomach,” remarked Brian. Although a serious contender, all unanimously concluded the hippo pool ranked higher for sheer gross-out value. Back at the main road, I was surprised to see the lights of another vehicle, which turned out to be a research unit studying park predators. “They will stay with the hyenas all night,” remarked Brian. Spotlighting en route to camp, we were rewarded with some rare sightings, including serval (like a large housecat on stilts) and a pair of honey badgers. The latter are notoriously bad-tempered; even lions have been known to give them a wide berth. Upon arrival, there were no researchers or leopards to be seen—only an elaborate surprise. A bush barbeque was in full swing with copious amounts of meat grilling, the fragrant smoke wafting through the African night. Nearby was an immaculately set table, a fully-stocked bar and a roaring campfire surrounded by comfy chairs. Africa never ceases to surprise! The next morning was another bush walk, this time to Kapani Camp. Lucy and Tim were staying here but I had a ride waiting. Bidding them farewell, I set out for my final stop at Chinzombo Camp. Set within 60 acres of private land alongside the Luangwa River, Chinzombo was newly opened during my visit. Sheer luxury, the camp offers six villas, each with spacious living areas, luxurious bathrooms and private plunge pools overlooking the Luangwa River and park beyond. Shaded by msiki trees, a footpath connects the villas with the lounge and dining area. Even in daylight, a stroll requires vigilance, as elephants and hippos are frequent visitors. A large hippo print in the mud near my front door proved that fact. With a spacious terrace, private pool and free wi-fi in each room, this was a safari with style. Game drive. After a sumptuous buffet lunch, it was time for an afternoon game drive with guide Abraham Banda. With 20 years’ experience in the bush and recipient of the prestigious Zambian Guide of the Year award in 2009, I was in exceptional hands with “Abes.” A short boat ride across the river revealed a waiting safari vehicle and we set out. The river’s broad expanse was but now a trickle, with embankments towering on either side. A dozen giraffe stared from the water’s edge while elephants grazed, unperturbed by our presence. Acacias, the omnipresent thorn trees of Africa, dotted a landscape burnished gold by the late afternoon sun. Troops of yellow baboons foraged alongside puku, warthog and zebra. A puku fawn suckled its mother so violently it made me wince. Despite being the dry season, birdlife was also plentiful. Helmeted guineafowl skittered across the road while lilac-breasted rollers and red hornbills perched in trees alongside. A pair of crowned cranes in flight was a first in three trips to Africa. Alice the leopard. An entourage of vehicles proclaimed something special. “Leopard, I think,” said Abes. He was spot on; sitting near the vehicles was an adult leopard, rendered nearly invisible against the surrounding vegetation. With the surrounding vehicular entourage, we had to settle for a distant sighting. The ensuing day proved more successful. “She lives here so we have a good chance of finding her,” remarked Abes, scanning the surroundings with binoculars. We soon found her lounging in the cleft of a small gully. Yes, it was a she; Alice to be exact. Something of a celebrity, she has been studied for some time and is well known to the park rangers and guides. Being the only vehicle around, we enjoyed a remarkable half-hour encounter at very close range. 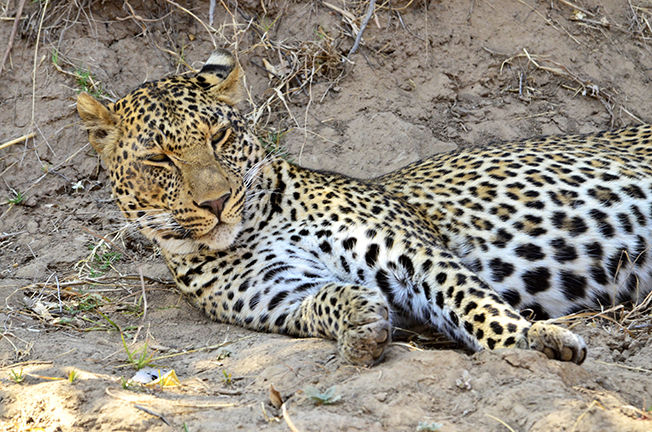 South Luangwa is renowned as one of the best places in Africa for leopard and it did not disappoint. Superb! The remainder of the day was rewarded with numerous encounters. An amorous bull elephant charged an unreceptive female that promptly got out of his way. Thornicroft’s giraffe blended adroitly with the surrounding vegetation, while a herd of zebra eyed us warily from a safe distance. Ancient baobab. 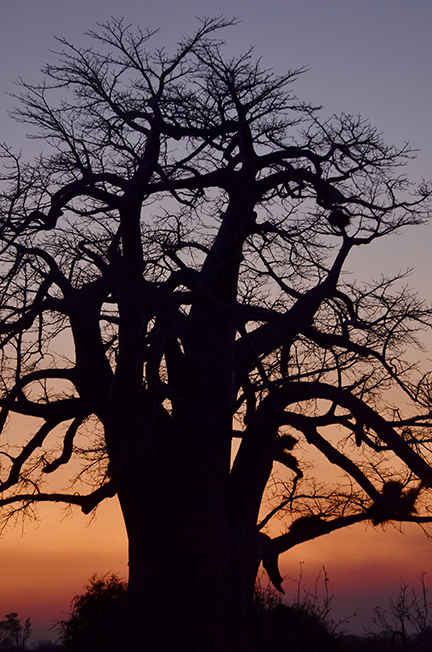 For my final sundowner, we stopped by a colossal baobab tree Abes estimated to be 1,000 years old. Venturing closer to capture the sun setting behind the twisting branches, I was cautioned to stop. From deepening shadows, a quartet of elephants passed alongside the tree—two adults and two juveniles. One of the youngsters was clasping its sibling’s tail with its trunk. Heading back after a final night drive, we traveled all the way by road, crossing the bridge over the Luangwa River. Glancing upwards, I glimpsed a falling star fracturing into three glowing pieces. A magical end to a magical stay. Special thanks to Malawi Tourism, Wilderness Safaris, Kaya Mawa Resort, Norman Carr Safaris and Africa Tours.